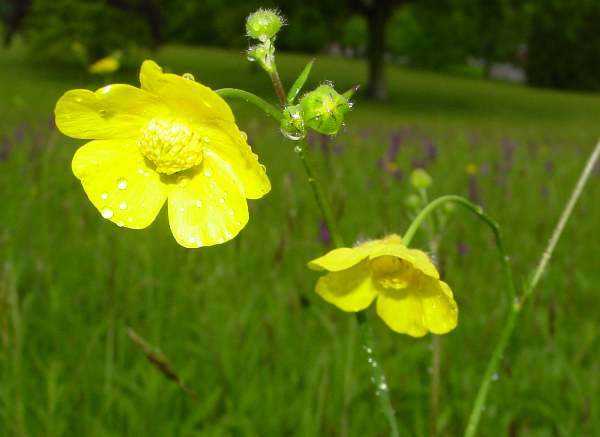 Meadow Buttercup usually grows to a height of about 75cm but can reach a metre or more. This hairy perennial has toothed, palmate lower leaves and a few lanceolate leaves at flower stalk junctions. Flowers are borne singly on unfurrowed stalks branching from stems, with a terminal flower on a stem rather longer than the others. Each flower usually has five rounded sepals - there are no true petals, but most people use the term petals when describing these flowers - forming a shallow cup 1.5 to 2.5cm across that gradually flattens out. Seeds are produced in star-like achenes (segmented seed pods). Widespread and common throughout Britain, Ireland and most of northern and central mainland Europe, Ranunculus acris is also native to parts of asia. This buttercup is also present in Australia, New Zealand and North America. It's in the common name, of course: these are wildflowers of damp permanent-pasture meadows, but they can also produce impressive stands on grassy roadside verges. Ranunculus acris blooms in Britain and Ireland from April until October and is generally at its best from May to July. 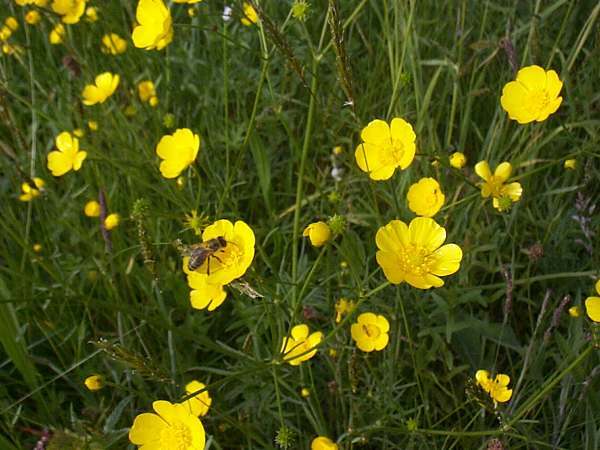 Buttercups contains an irritant latex that can cause very unpleasant reactions in farm animals and in people. The acrid taste of Meadow Buttercups (and indeed to a degree nearly all common buttercup species except the Goldilocks Buttercup Ranunculus auricomus) seems to be sufficient deterrent, as there have been only a few cases of serious poisoning. The genus name Ranunculus comes from the Latin rana, meaning frog, while the suffix -culus indicates the diminutive form - hence Ranunculus means 'little frog'. The most likely explanation is that both frogs and Ranunculus wildflower species are usually found in damp places. The specific epithet acris means bitter tasting (as in acrid). Folklore has it that, because of the yellow of the buttercups, cows grazing in buttercup-richmeadows provided the finest butter. There are many other buttercup species. Creeping buttercup Ranunculus repens is often found in lawns and gardens, while the bulbous buttercup Ranunculus bulbosus is another farmland species. 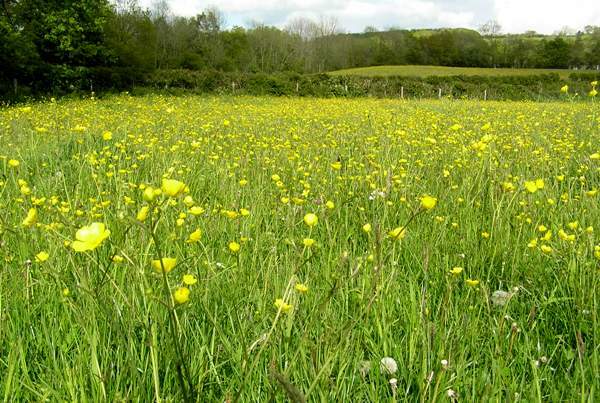 The pictures of Meadow Buttercup shown on this page were taken in West Wales and in Somerset during May.